With the Kodi TED Talks addon you get access to many talks and conferences from outstanding speakers from all over the world. How to install Kodi TED Talks addon? If you have the official Kodi addon repository then it's pretty easy to install TED on Kodi. This repository comes standard with your Kodi installation. So all you have to do is find it and install your Kodi TED Talks addon. Navigate go to Addons -> Install from repository, from the Kodi main menu. Next, find the Kodi Add-on repository and click it. This takes you to a list of categories for available addons. To install the Kodi TED Talks addon, you need to browse the Video add-ons category. From here, select the TED Talks addon. Click it and you will see the addon information page. Click the Install button and you will get the Kodi TED Talks addon on your Kodi media center. From this screen, click the Install button to get TED Talks on Kodi. Wait for a few minutes. You should see a notification in the top-right corner of the screen indicating that the addon is ready to use. You will see this notification once the Kodi TED Talks addon has been installed. What to do after installing TED Talks on Kodi? That's it! To use your newly installed Kodi TED Talks addon, head to the Add-ons section of the home menu. There you will see it under Video add-ons. 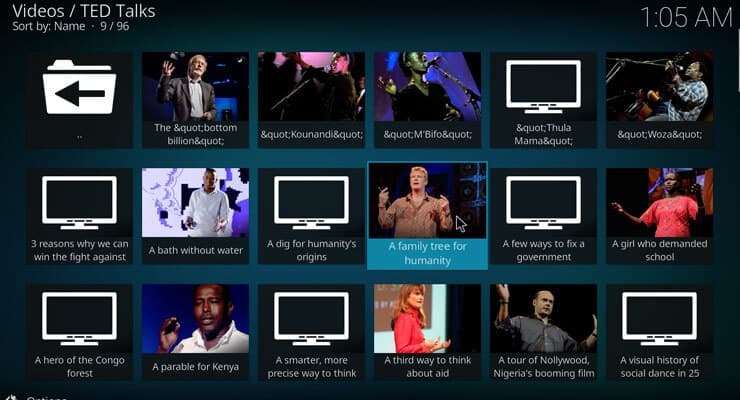 Click it, and you will be able to watch TED Talks on Kodi and explore all the free content this addon offers! Do you still want more content for your Kodi HTPC? After you install TED on Kodi you might consider other options. Have a look at these 10 best Kodi legal streaming addons in order to get more addons from the official repository. Alternatively, venture into the amazing content options offered by addons such as these 10 best Kodi movies 2017 addons or these 20 best Kodi sports 2017 addons. Expand your content options with these free plugins and get detailed instructions and ideas from our addon guides!